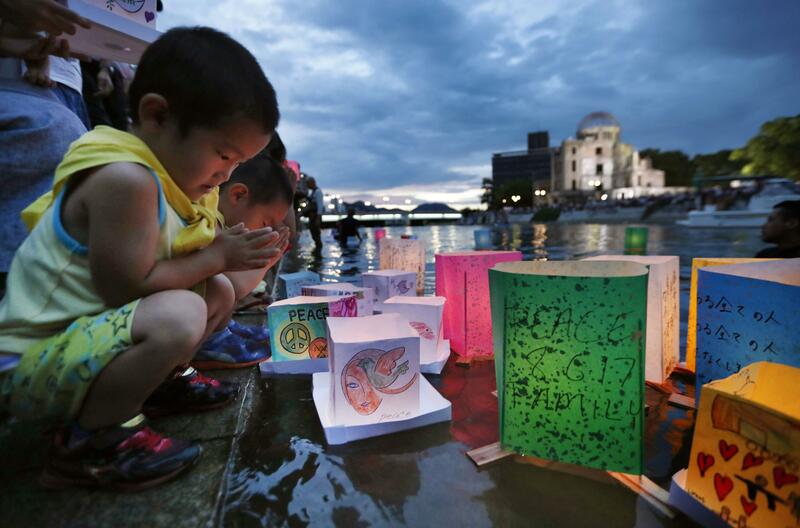 Hiroshima marked the 72nd anniversary of the U.S. atomic bombing on Sunday at its annual memorial ceremony, with Mayor Kazumi Matsui calling on the Japanese government to help realize a treaty banning nuclear weapons. 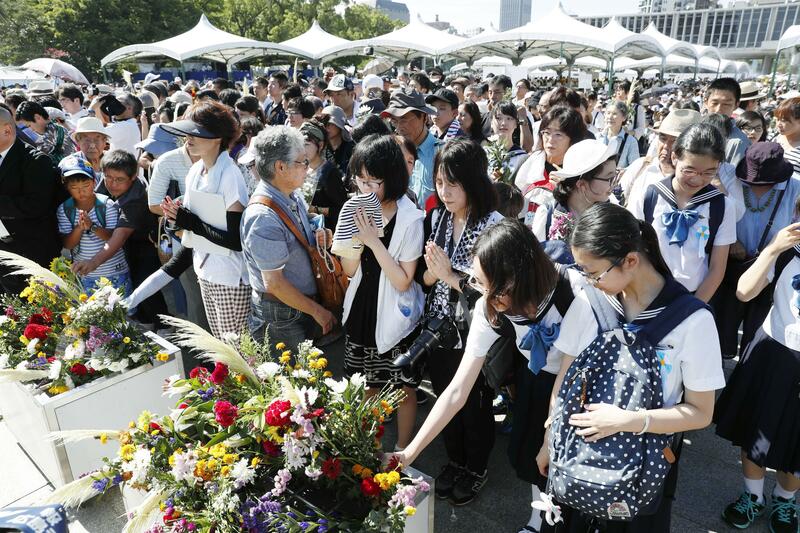 This year's ceremony at the Peace Memorial Park near Ground Zero follows the adoption by 122 United Nations members of the world's first treaty to comprehensively prohibit nuclear weapons. The pact's preamble uses the Japanese term "hibakusha" in its mention of the "the unacceptable suffering" of survivors of the Hiroshima and Nagasaki bombings that killed an estimated 214,000 people by the end of 1945. But Japan refused to participate in the treaty, along with the world's nuclear weapon states and other countries under the U.S. nuclear umbrella. In the city's annual Peace Declaration, Matsui stopped short of demanding that Japan join the treaty, but urged the government to "manifest the pacifism in our Constitution by doing everything in its power to bridge the gap between the nuclear weapon and non-nuclear weapon states, thereby facilitating the ratification." He said the countries that adopted the treaty "demonstrated their unequivocal determination to achieve abolition," and that now is the time for all governments to "strive to advance further toward a nuclear weapon-free world." Prime Minister Shinzo Abe avoided any mention of the ban treaty in his speech at the ceremony. "For us to truly realize a 'world without nuclear weapons,' the participation of both nuclear weapon states and non-nuclear weapon states is necessary," he said. "By firmly maintaining our three non-nuclear principles (of not producing, possessing or allowing nuclear weapons on Japanese territory) and continuing to appeal to both sides, Japan is determined to lead the international community," he said. The ceremony was attended by representatives of about 80 nations plus the European Union. The nuclear states Britain, France, the United States and Russia were scheduled to attend, as well as India, Israel and Pakistan, which are known to possess atomic weapons but are not signatories to nonproliferation treaties. U.N. Secretary General Antonio Guterres called for all states to work toward a world free of nuclear weapons "in their own ways" in a message read on his behalf by Izumi Nakamitsu, U.N. undersecretary general and high representative for disarmament affairs. "Hiroshima's message of peace and the heroic efforts of hibakushas have reminded the world of the devastating humanitarian consequences of nuclear weapons...The United Nations stands with you in our shared pursuit of a world free of nuclear weapons," the message said. A moment of silence was observed at 8:15 a.m., when a uranium-core atomic bomb named "Little Boy" dropped by a U.S. bomber exploded about 600 meters above Hiroshima on Aug. 6, 1945, killing an estimated 140,000 people by the end of that year. A second atomic bomb was dropped on Nagasaki on Aug. 9 and Japan surrendered six days later, bringing an end to World War II. The combined number of "hibakusha," people who survived either bombing, stood at 164,621 as of March, down 5,530 from the year prior. Their average age was 81.41. 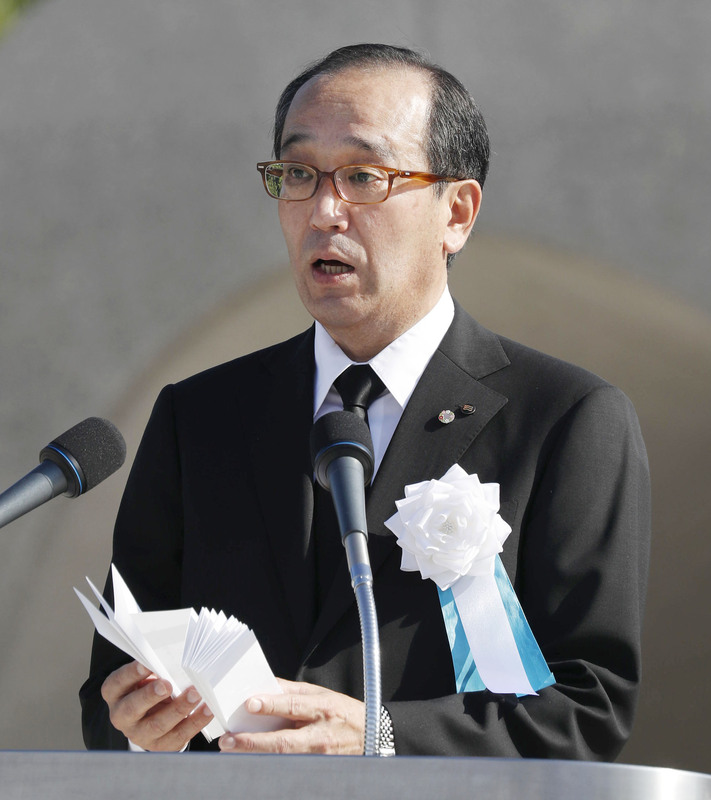 Matsui demanded in his speech that the government give more compassionate assistance to the aging hibakusha, as well as to "the many others also suffering mentally and physically from the effects of radiation." According to city officials, "the many others" include people affected by the March 2011 Fukushima Daiichi nuclear power plant disaster triggered by a devastating earthquake and tsunami. This year's anniversary is the first to follow the election of U.S. President Donald Trump, whose predecessor Barack Obama last year became the first sitting U.S. president to visit Hiroshima. Trump had suggested before his election that Japan and South Korea might acquire nuclear weapons in the future, and U.S. Secretary of State Rex Tillerson refused to rule this out in an interview with U.S. media in March, according to U.S. media reports. Braving high temperatures from the early morning, young and old visited the park ahead of the ceremony to remember those who died in the bombing and to wish for peace. Hiroshima native Masaharu Masuda, 70, offered a prayer as he does every year in memory of his parents, who both experienced the bombing. The midsummer heat reminded him of how his older sister always wore long sleeves when they were younger to hide keloid scars on her arms. Masuda said he is disappointed by the Japanese government's "half-hearted" response to the ban treaty, and worries that the world is losing interest in Hiroshima's message. "People used to say with feeling, 'No More Hiroshimas,' but I hear it less and less these days," he said. Naomi Miyamoto, 56, came from Tokyo to place flowers at the memorial and renew his commitment to peace and nuclear abolition. "I don't have confidence that the way Japan and other countries deal with each other will change any time soon, but one thing individual people can do is educate themselves about what happened here in Hiroshima," he said.